BREAKING: The Morrison Government has just failed to hold Adani accountable for illegal drilling into aquifers of the Great Artesian Basin. So now, Adani are trying harder than ever to bully the Queensland Government into ticking off their plan to drain Queensland's water. They've even taken out advertising demanding all their approvals be signed off "tomorrow". Despite Queensland's worst drought on record, Adani are desperate to start construction on their mine and begin draining billions of litres of groundwater. 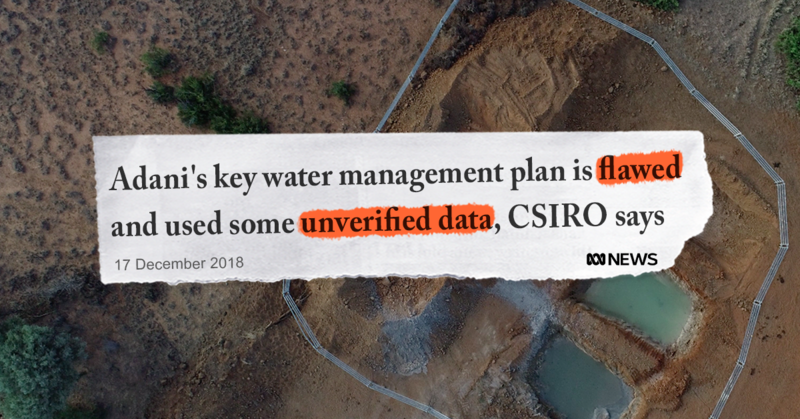 To make matters even worse, the CSIRO has also found that Adani is using unverified data in its water management plan. Adani wants to rush through government approval processes, pushing decision makers into approving plans that are based on unreliable data. Queensland has shown they can do the right thing when the people demand it. But with Adani pushing harder than ever, the Queensland Government will need to be reminded that the people want them to stand up for our water, our environment, and the rule of law. Can you add your name to the petition calling on QLD Premier Palaszczuk and Minister for Environment and the Great Barrier Reef Enoch to STOP Adani draining groundwater from ancient springs, and inflicting devastating consequences on Australia's environment? 'Adani's key water management plan is flawed and used some unverified data, CSIRO says', ABC News, 17 December 2018. Adani's water management plan has been found to be seriously flawed, and its data alarmingly unverified. Their proposed Carmichael coal mine threatens unique and precious Great Artesian Basin spring wetlands – not to mention the Great Barrier Reef! The CSIRO, conservationists and scientists are concerned – and so are we. Premier Palaszczuk and Minister Enoch, don't let this risky coal mine go ahead.